IF2 Series Fluorescent All Purpose Metal & Plastic Marking Ink Non-Porous and Film Producing. 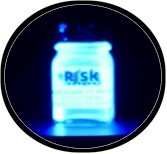 Risk Reactor Inc.'s IF2 Series UV inks are water clear, abrasion resistant, and produce a strong brilliant fluorescent color under black light activation. These products actually produce a coating that is water clear on the desired object. Applied thin enough you will not even see the coating itself. Our inks are used to mark metal, plastic, wood, concrete, marble, rocks, just about anything where you need a strong, incredibly durable invisible mark. Used extensively for sting operations, ownership, and product proof. "We use the IF2-C0 and IF2-C7 for our cosmic bowling alleys. The hard surface and brilliant color make this paint pop under black light. We been using this for 9 years and still going strong." Very durable marking ink for Plastic, Metal or Paper that appears Clear, Except under a Black Light. This Product Produces a Coating that is Wear Resistant and Adheres to just about Any Surface. Risk Reactor's All Purpose Marking Ink is Used in Product Identification, Ownership, Quality Control, and other Applications where you Need to Invisibly Mark a Surface for Later Identification under UV. Theft and the need to invisibly identify your products or personal belongings are more important today than ever. 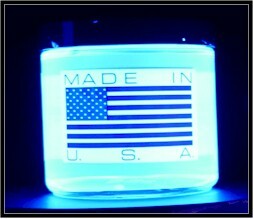 Use Risk Reactor’s Invisible Inks and special Black Lights to secure your property, tools, or products. Law enforcement around the world know the power of using invisible markings to catch criminals and get the identified property back. Business owners, law enforcement sting operations, property owners, and home owners use our tools to secure their property and future. 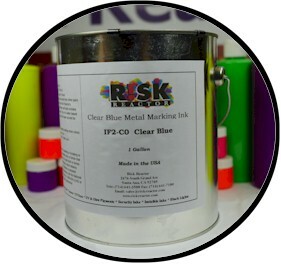 IF2-BKOZ Clear Black Metal Marking Ink by the ounce. Gallon of IF2-BK Clear Black Marking Inks.